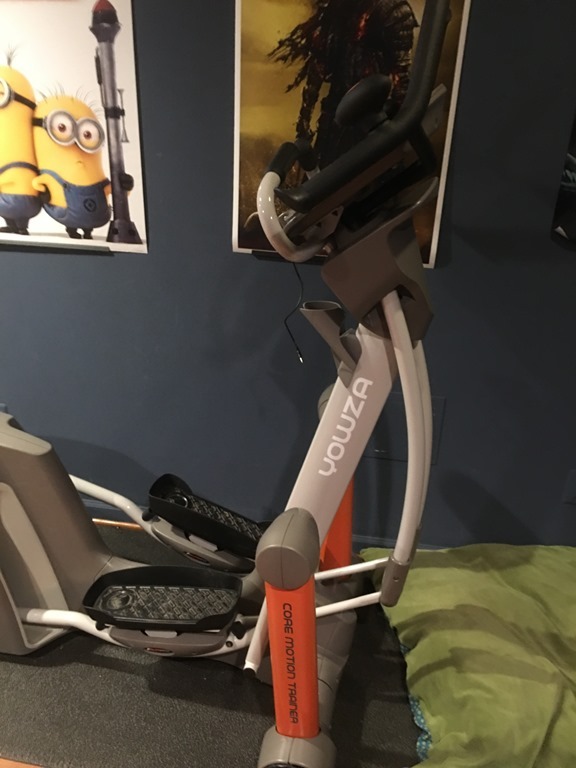 Just another Shameless review: Yowza Elliptical Machine!!!! The value in excursive equipment is actually using it! Recently we got rid of the treadmill we’ve had the past five years because no one was using it. It sat in the basement unused and taking up space. Barb decided instead she wanted to replace the treadmill with an elliptical. She spent a lot of time researching the impact of front versus read mechanism. Apparently (I used to hate Elliptical they hurt my knees) the rear drive machines are much less wear and tear on your knees). The thing is heavy (we moved it Luke, Nick and I.) it weighs a solid 300 pounds. It is sitting on a mat to protect the floor a bit. First off my knees don’t hurt when I use this elliptical. They have, always, hurt when I used elliptical in the past. The device works both legs and arms. The arm bars move back and forth working your core, and both arms as you walk. It is solid! As I said it weights a ton. The connected software is very nice. It’s a Bluetooth connection that you can use to play music, or use your device as a dashboard getting more information from the machine. The software is well done. The unit is quiet. You don’t hear sound other than what you are trying to hear. The controls are easy to operate while in motion. There are four distinct hand holds so you can vary the workout considerably. You can have short motion, long motion, mid range motion and a pulse bar (no motion). You can easily vary incline of the machine and the resistance your arms get when moving the arm unit. Honestly the only big thing I don’t like is the speakers. It has a nice airplay an plug in speaker system but frankly the speakers are lower quality. So I don’t use the onboard speakers very often if at all. First off, I had never heard of Yowza. Barb did a lot of research and gets the credit for all that hard work. The company is great (we had a piece break and they were out 6 days later fixing it. Six days isn’t bad when you consider they shipped the part then came out to fix the unit). The unit is solid, quiet and as I said in the review it doesn’t impact your knees as much as the front motor units do. If are in the market for excursive equipment there are two simple things to consider. The first and probably most important is can you fit the equipment into your busy day. I use the elliptical in the early am now, adding 15-20 minutes in the early morning. It adds around 2000 steps to my day which is good (fit bit records the steps even when you are just standing still well moving up and down but not forward). The second is how much do you want to spend. I’ve bought the 900 dollar treadmills and frankly they break eventually. I’ve gotten the 300 dollar front run elliptical and they also break (and hurt my knees). The Yowza is a little more cost upfront but if you are in the market – I highly recommend it!!!! Like this review? I have more localized reviews on Yelp (https://www.yelp.com/user_details?userid=94Spks2KcXSwNHIfVwLSmg) posted as Docandersen. 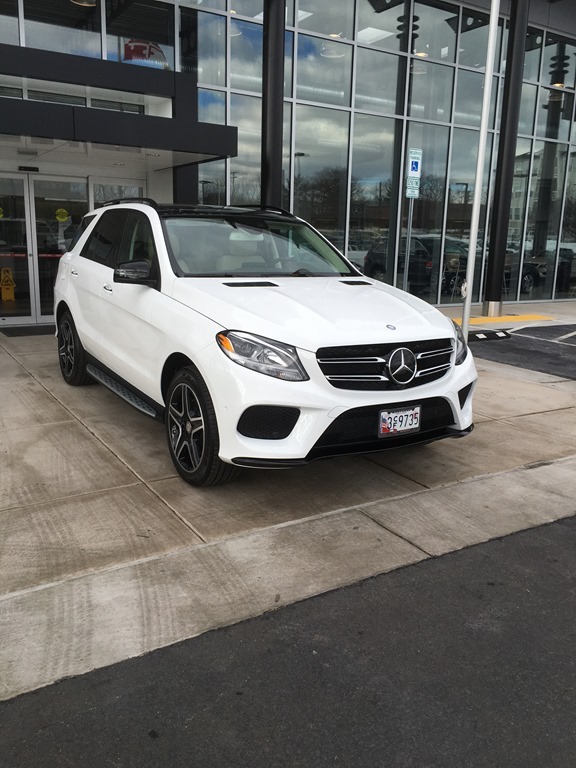 Just another Shameless review: Mercedes Benz GLE 350.. I am going to take a couple days break from the family history and the “memories of mom” blogs. Not for lack of material but because I have a couple of reviews I have been wanting to do for a while. I have moved my restaurant reviews to Yelp. (Docandersen) if you are interested in those. I also review local businesses that do exceptional jobs at Customer Service on Yelp! My first review is of a car. Let me say that I tried to be green and drove a smart car around DC for over a year. Yes the mileage was great but there were two factors that caused me to not feel safe. The first was all the other drivers that didn’t see the Smart Car and cut me off. The second was on a windy day (and we like everywhere have those) the car felt unstable. So without further adieu my review of the Mercedes Benz 350 GLE 4Matic. Barb and I have owned more than 20 cars over the past 25 years. We’ve always had three criteria when selecting cars. Is it a safe car. Does it have the technology we want. Ok, the last one is just my rule but Barb let’s me keep that one. So I wandered around looking for a new car this late winter opt replace the Smart for Two. Dealer – simply an amazing experience dealing with Euromotorcars. The entire team there made the car buying and now car ownership experience smooth. Ride – I have never had a car in my life that has a ride like this one. I have wanted a Benz for more than 30 years. The ride is simply amazing. Power – enough to get me out of trouble. The car is smooth when accelerating. Seats- holy cow, the heated seats are amazing. But the package we got includes massage. When you are stuck in traffic and turn on massage, the stress flows away from you. Technology – every works easily. What should be a one push button, is always a one push button. Handling – first the car doesn’t get buffeted by winds as I cross the bridge into Virginal. Secondly it has the automated lane warning and automated braking packages and help me stay focused. Mbrace – the onboard Mercedes Benz safety system like the various other cars have. I love being able to call someone and give them the address and they load it into my GPS for me. integrated traffic and weather – I’ve had integrated traffic in the Mini’s for awhile. This one is really nice and paints the traffic on the screen as colors, so you know what is coming. I have wanted a car like this for 30 years. I honestly have to say the only thing I don’t like about this car is that I didn’t consider Benz right away. We went to the dealership on a lark, it is literally 3 miles from our house why not. I was expecting the Benz to come in 30 to 40 thousand dollars more than it was. The price is a little more than the Acura (another car we test drove) and 10 grand less than the BMW, Volvo and Land Rover. I have drive this as my primary car for the past month. During that time I have become accustomed to riding in comfortable seats and seeing far ahead in traffic. I love feeling safe when I am driving. I also love the fact that when I turn the car is watching out for me. The other morning there was an accident on the way to work, I was going slower because I saw brake lights way ahead, but didn’t realize the car in front of me was going to turn off at the U-Turn access. He slammed on his brakes and my car notified me. I reacted and avoided a problem. Euromotorcars of Germantown is an amazing dealership to boot! It goes against my upbringing to buy a car that is both fun and exciting. My role models trained me to go practical for cars. I’ve added heated seats and XM radio as practical requirements but now I have quite a few more requirements for practical! A one day break from the family history project to do a review. I have a huge number of reviews stacked up now. I do restaurant and services reviews on yelp if you are in the northern DC area and looking for a good meal. But technology reviews are here, so let’s do one! For those of you that have followed this blog for a long time my shameless reviews started out on this blog 10 years ago. I moved them to my other blog for a couple of years or so but pulled them back to here based on reader feedback. I have searched for the perfect combination of paper and pen to digital for a long time. I love the abeam products that convert whiteboards into digital interactive spaces. The problem with the eBeam products is the size of the markers. Enter the Smart Board by Kapp. Use regular dry erase markers. Any dry erase markers. No special holder or casing required. You see the magic is in the Smart Kapp board and its software. Setup was fast and simple. Using the app on my iPad I literally took a picture of the bar code and was connected to the board. I can using my iPad share the active whiteboard in a live meeting. That makes meetings so much more functional. software is ok, could be a lot better. I am hoping upgrades are coming! Wall space is my one concern. I don’t have as much in my basement work space as I would like so losing a chunk for a smart board is a little painful. It is worth it however. I have a large rolling whiteboard, two on the wall painted whiteboards and this new board. It works very well in the space I’ve put it in. For a classroom or conference room setup for conferences it would be an amazing addition. In fact you could for less than 2000 create the ultimate audio and video/whiteboard integrated office by simply getting the Logitech conference system and the Smart Board by Kapp. The software is the weak point right now. Real time capture of whiteboards is however something that adds a lot of value. Some people think better on their feet. It really works well in a web meeting format (I’ve tried MS Live meeting and WebEx, I haven’t tried any of the other services yet). Overall I would, if you are in the market for an interactive whiteboard that you add this one from Kapp to your list of considerations. It gives you more features and the ability to just use whiteboard markets of any kind on the board. It is nearly flush with the wall so you don’t add a lot, the 42inch is great for one person and the larger wall mounted unit would work for two or more people at the whiteboard. There are a number of things going on right now that I haven’t reviewed or talked about so a day off from the Family History project for a Shameless Review! First off, I like having a color laser printer at home. It cuts down on the times I have to go to work to print a single document, and it cuts down on the same for everyone else in the house. I connected to my network and everything could print to it in seconds. Duplex printing is quick and reduces the amount of paper you use by a lot! has a mobile application – that works for scanning and faxing as well as printing from my iOS and Android Devices! Fax answers the phone on the 2nd ring if the phone you are using isn’t directly connected to the answering machine port. We’ve had the printer for about 6 months. It replaced the HP we had before that for nearly 6 years. So first kudos to the HP printer for still operating after 6 years of moderate printing! The canon is a little smaller and a little smarter about Wi-Fi networks which means it is easily printed to from any device. I use it as my iOS printer. It does a great job on color printing. Overall this device costs a lot less, is cheaper to operate and has high quality prints. Canon has come a long way in the printer market in the past few years. I am down to three printers in the house (and one portable printer) and two of the three are Canon. If you are in the market for a home color printer – this is the one! So I upgraded to the new iPhone last week. I had the 6 plus previously so I continued the larger phone trend and got the 6s plus. As always the Apple Packaging was amazing. The screen when I turned it one was amazing. I was a Windows Phone guy from 2000-2011. I had every iteration of PPC phones there were (ok well not every but it felt like it). I have to say the seamless upgrade and transition process of the Apple iOS solutions are simply amazing. A cellular phone is not just a cellular phone anymore it is a CPS/IoT platform as well as personal video and still camera always with you. From call recording to voice recording, data and simple entertainment the cellular phone now replaces a number of devices. Plus it is the platform of expansion for the future of CPS. For those who always complain when I post a review remember I only review things that I find useful or companies with horrible customer service. · The AT&T setup experience is improving every single time. · iOS9 includes the Wi-Fi calling option!!!!!!!!!!!!! · The new camera and camera options are incredible. · Frankly the fact that the battery is no better than it was. · Wi-Fi Calling is not available in my area yet for my iPhone. Overall the phone is a solid improvement over the previous version. All of my accessories (except the one) work perfectly with it. I’ve tested most of my favorite software packages and they operate as well. I was able to connect and reconnect all my Bluetooth devices very quickly. Overall this is a great new version of the phone. I am still waiting for a long conference call to see how audio quality holds up for the entire long call but like I said other than the one minor frustration really solid upgrade. First off, the image on the left is of the Control4 home screen but is not of my home screen it is a stock image. You can access the home automation system from your iPad, iPhone, Android phone, Android Tablet, Windows PC or from dedicated tablets and from your television with the Control4 remote. Home automation projects run the gamut. People seek a variety of different automation systems to fix a variety of problems. The easy projects are creating connections to lighting and electric outlets. Or automating your garage doors. First off with the system you have the ability to add the Control4 remote. I highly recommend that universal remote. First because it allows you to control your home automation system from your television. Second because it just makes everything operate smoothly. Secondly I recommend getting the integrated screens that always display the system screen. It makes using and operating the system easy and includes an audio/video intercom for you home. Control4 is expandable. We’ve added several components beyond our ordinal installation and Control4 is able to adapt to them quickly. Our automation partners Smart Home Automation of Gaithersburg are amazing. Cost – home automation done right is not cheap. Overall as my original review said, the product is simply amazing. A link to the partner we use and my Yelp review is here. Its nice to always have a garage remote with me. I seldom go places without my iPhone anymore and the Control4 application is happy to connect to my home system and tell me that the garage doors are open. or to open them for me. I spent a lot of time talking about Home Automation solutions on my other blog trying to come to a logical sense of what is possible, what is advertised and can you make it all work together. So far, sticking with one controller has been the easy answer. There are devices that you have to use more traditional IR controllers for and others that you can see wireless connections for. In the future I suspect more people will automate their homes. By then I will probably have moved on to my next gadget craze. We recently added a Smart Car to the family. With Jakki driving now and me driving to Virginia we wanted to reduce the cost of gas spend on a monthly basis. We were considering a number of vehicles and weren’t going to buy one until the end of March. But that all changed when we walked into the Smart Dealership in Germantown and they had the perfect car for us. visibility for the driver is very good – one blind spot on each side of the car that you can fix the mirrors to resolve. Most turtles can beat the car to 60 mph which isn’t bad except in really aggressive driving areas. Then you just don’t move fast enough. Gasoline prices are not going to stay below 2.50 a gallon. I can live with the things I don’t like. You can prepare for wind and the acceleration is simply a planning issue as to when you get into the lane. Getting cut off is frustrating but in the end I am working on not reacting to aggressive drivers it isn’t in the end my problem it is there problem. The Smart car we got is not a stock car. We added an aftermarket (Panasonic) GPS and Radio to the car. The rest of the car is factory installed. The heated seats are a nice addition. It is a great commuter car. Great gas mileage and other than two spots on my commute I don’t have to worry about wind. Overall the car is a great addition to the family stable. It isn’t a car for the whole family just the car to get one or two people somewhere. It handles very well and even in high wind situations it is for the most part stable. Overall if you are looking for a zip in and out of traffic commuter car – this is the one for you. Our gasoline costs per week went from 44 dollars a week to 17 (comparable gas price per gallon as well) At one point we were with gas well over 3 dollars a gallon heading towards 60 bucks a week. Did I mention the car glows in the dark?